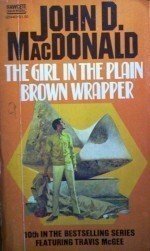 The Girl in the Plain Brown Wrapper John D. MacDonald Book Condition: MMP has shelfwear to edges and covers. Pages tight and clean but yellowed due to age. PO name inside.From the Inside Flap: 10th in the series featuring Travis McGee. McGee delves into the mystery of a rich and beautiful wanton who happens to be losing her mind, a little piece at a time. As he probes, he uncovers some of the strange corruption's that simmer behind the respectable facade of a quiet Florida town.ISBN:0231020236SKU: 0708120151Visit my eCRATER Store for other great books and save on shipping! Most books have shelfwear and cover scuffing. Binding is tight unless otherwise noted. Actual covers may be different than stock photos. If condition is important, please ask for a more detailed description. All prices are in US dollars.DOMESTIC SHIPPING: Most shipping is by Media Mail with delivery confirmation. Discounts available for multiple books that are paid for in one transaction. Priority and Express mail available. Email for details.INTERNATIONAL SHIPPING: We ship worldwide for actual postage plus $1.75 handling per order. International buyers must contact me for final costs before making payment.We only accept PayPal for International orders.Pay me securely with any major credit card through PayPal!